The core of our Continuous Mixers/Aerators consists of a very efficient mixing-head which exists of a rotor and a stator. Trefa Continuous Aerators deliver a homogeneous result with a very constant foam density. 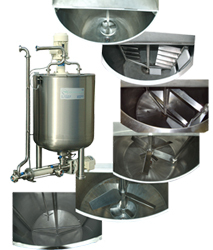 Trefa Continuous Mixers/Aerators are completely made of stainless steel and designed for easy cleaning and maintenance. 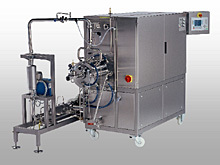 The machines can be connected to a so-called CIP-system ( Cleaning In Place ), or may be equipped with an integrated cleaning pump. By using modern PLC technology and a touch screen, there is a good overview of the process and the machines are very easy to operate. 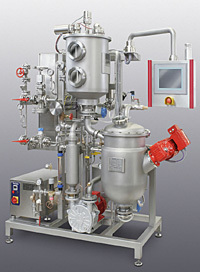 Applications like Automatic Density Control guarantee a constant quality of the outgoing product. All settings for the product recipe can be stored in the system memory. This reduces the changeover times drastically and makes manual adjustment of the mixer redundant. Each Trefa machine is built with durability in mind, our machines have a lifetime of many, many years. 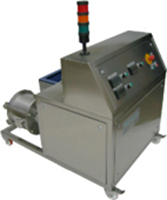 Existing Trefa Mixers/Aerators are easy to upgrade to the latest technological developments in the field of PLC. Trefa test equipment has all the properties of the final production model, the same simple operation, easy maintenance, homogeneous end product, exact density and constant air inclusion. And last but not least, the results of Trefa laboratory equipment can be upgraded to the production models. With the Trefa blender machine it is possible to blend different ingredients in-line, on a continuous basis, into a foam. 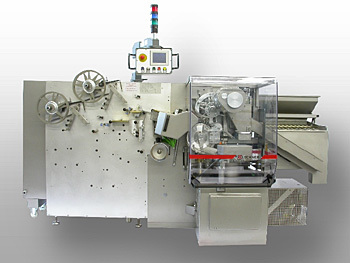 A unique advantage of this machine is the minimum of structure damage to the product, without the risk of clogging or damaging the ingredients. Solid particles of different sizes like pieces of (dried) fruit, chocolate, nuts, raisins, etc. The ingredients are carefully mixed together in the specially designed mixing head, without the risk of product damage or disturbing the delicate foam structure. The result is a very stable and homogenous end product. 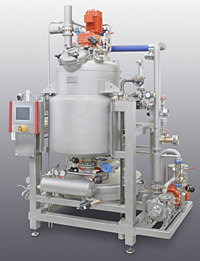 During this process the mixing head, if desired, can be cooled or heated. 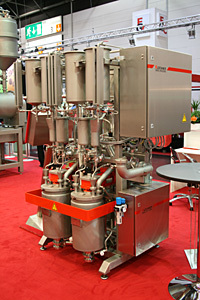 In addition, the machine can be equipped with injection point for flavor and/or coloring agents. 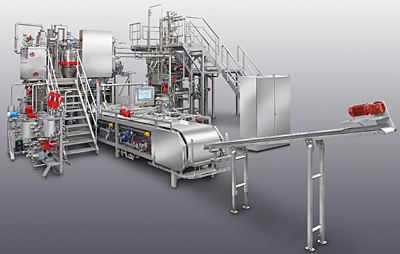 Naturally, the machine is designed and manufactured for hygienic processing of your products, therefore the whole machine is made of stainless steel and can be connected to a so-called CIP-system (Cleaning In Place). 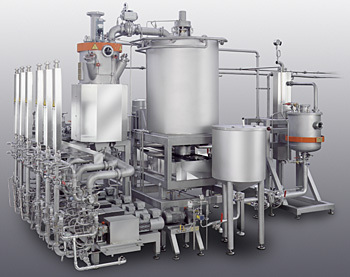 Trefa Pre-Mixers, mix wet and dry ingredients into a homogeneous mass without aeration and are used in products such as: Cake batter, Cake-filling, Cheese Cookies, Pound Cake, Muffins, butter fat creams, bakery creams and many other applications. 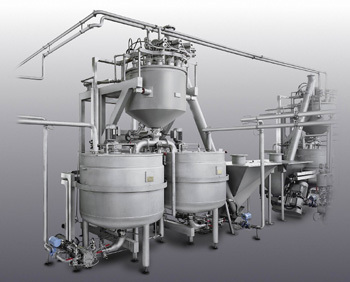 Trefa Pre-Mixers produce a more stable, homogeneous and constant pre-mix than conventional batch mixers. Each application has different stirrers (agitators) that mix the wet and dry ingredients with a minimum of air mixed in. After mixing, the mass can be pumped to a buffer tank, in order for the mixer to directly be used for the next batch. These Trefa pre-mixers are also completely made of stainless steel and designed for easy cleaning and maintenance. 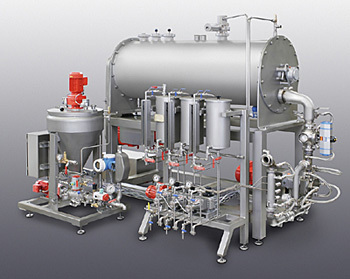 The machines can be connected to a so-called CIP-system ( Cleaning In Place ), or can be equipped with an integrated cleaning pump. 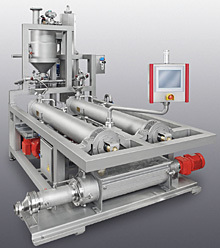 Batchwise working universal cooker as single aggregate or component in complete line. 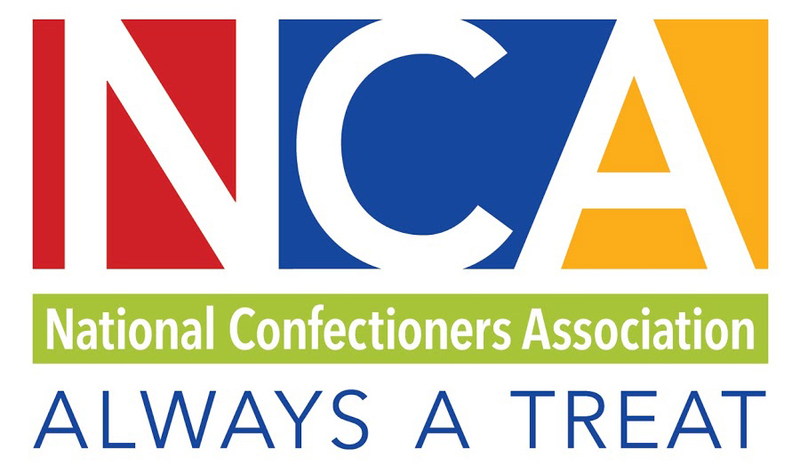 For: fillings, caramel, toffee, chewy candies, binding masses, etc. 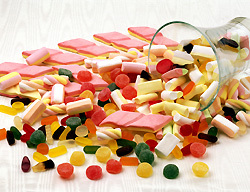 New developed forming chain for highly-filled, bur-free candies, especially of interest for specialities packed in blister. For: dosing units designed for 1-8 colours; for the enrichment of the jelly masses with colours, flavours, acids vitamin solutions etc. Independent control of cooking process and caramelisation. 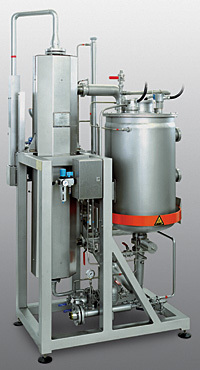 Can be perfectly integrated in a continuously operating line for the production of milk caramel masses. The mass is continuously guided through a jacketed warm water heated tank. a special agitator supports the product flow through the system and guarantees an exactly defined residence time of the mass in the system. the desired caramelisation degree can be controlled independently from the cooking process by the variation of temperature and residence time.